Weapon and surveillance for Tyberion Damiani. Dallgan can change their forms from a large ‘void’ beast from their realm, or a humanoid angel appearance. 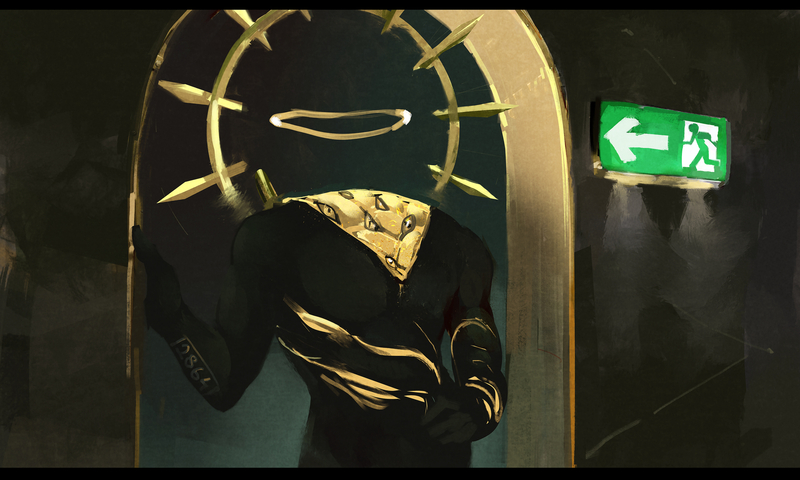 Angels without heads have been cast out of the higher realm a sort of ‘heaven’ Dall is one of these. After being banished their first form is altered so they are recognizable from higher angels, these cast out beings are scattered throughout the universe and rarely found. Identifiable features are headless humanoid forms with broken or full ring like halos, some have wings stripped of feathers down to bone or eyes over their body. Appearances can vary depending upon how severe the offense they have committed. Making others feel valid/ appreciated. They have multiple eyes lining the tissue of their neck. Black with dark crimson hues. Golden scars run from their forearms over the stomach. Experiment number imprinted into their right forearm. Much of Dallgan’s origin and past is unknown. Their species has been nearly wiped from existence due to the threat of their abilities. There are few unworldly gods left, many of their creations in the alter world still live in peace there. Dallgan is a being that can warp their appearance into weapons used by their "master" or "wielders". Their previous wielder used them for their abilities and discarded Dall to a group who paid a large sum to obtain them for experiments on diminishing their species abilities. Dall was kept in the underground labs where their captors ran tests and totured them for years by keeping them in a flourescent room at all times so they were unable to gain any energy. This made it nearly imposssible for Dall to maintain their form or move. During a facility raid Tyberion and members of his group took equipment and other materials from the warehouses. In their intrusion they broke into the room where Dallgan was held restrained. After Tyberion decided to release them, Dallgan pledged them self to protect Ty, giving him full reign over their abilities. Dallgan still works for Tyberion after many years despite his opinions on his partners actions and methods. On the inner wrist of their right arm Dall has the numbers  printed into their ‘skin’. These numbers were forced upon them when they was held captive in the base, they keep Dall in their system for logs about their condition and progress with experiments. Dall does not eat material substances. Though they can take in energy from dark areas. Their ability to transform depends upon their wielder and their energy source. The more energy the wielder has the stronger Dall’s source is to work with and the more effective his form, power, and accuracy will be. Dall's shadow warping ability is only to distances that are visible to them and also dark. Buys their beloved cat special foods even though they don't actually need to consume physical matter. They are capable of holding different forms, but usually keep the simpliest one for less energy expulsion. Naldhes is a genderless cursed angel. They are a part of Dallgan. When they appear, they are seen at the end of hallways and alleys, standing completely still. They are usually faceless.